First Ever Polish Addict Giveaway – Win Color Club Musique Collection! Thanks to the wonderful people over at Color Club the Polish Addict is hosting its very first giveaway, ever! Follow this link and fill out the entry form for a chance to win the entire Color Club Musique Collection including the 3 liquid lipstick shades. The winner will be chosen on September 23rd (which just happens to be my birthday : P). You can check out my swatches of the Musique Collection here. This contest is actually the first part of a sort of two-part ordeal. My initial idea was to host a contest for the best franken made from Color Club polish but I realized that a lot people don’t have access to Color Club or have never tried the brand, so I decided to start off with a straight-up giveaway first. On the 23rd, I’ll launch the Color Club Frankenpolish Contest. The best Dr. Frankenpolish will win the Glitter Vixen Collection! This is serious. 44 bottles of Rescue Beauty Lounge is pretty much all I’ve ever wanted out of life. I’m thinking I might have to resort to some of the ol’ folk magic from the mother country so as to increase my chances of winning this giveaway. My mom told me something once about breaking a double yolked egg over an upside down straw broom… or something. Ok maybe not, but Animal sacrifice would help for sure, right? Geez, I can’t hurt animals… a giant can of chicken breast from Costco that my mom bought for me when I first left home 6 years ago and has been sitting in my cupboard since then… would that be ok? Maybe sacrifice goat cheese instead of a whole living goat? Ugh, where’s a first-born when you need one. Ok – I know what I have to do. You have served me well throughout elementary school as my Thanksgiving Day art project. Yes, indeed, many gold stars have resulted from your efforts on my behalf. Remember that year when I drew you and your entire turkey family? Hours of staring down at my hands to create that masterpiece, perhaps, was the genesis of my current love, nail polish. But now, it is time for you to fulfill a greater destiny. You will be sacrificed to the nail polish gods so that the evil Ji Baek, arbiter of expensive polishes, may bestow upon me a most amazing bounty. 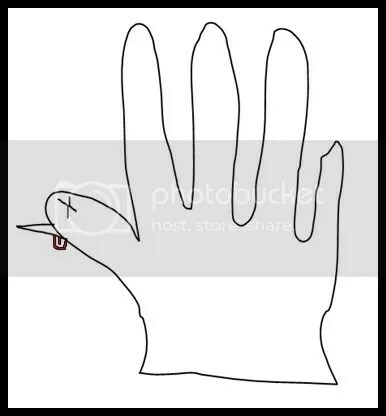 Hand turkey, you will be missed.